Today more than ever nonprofits know that they need to develop a long-range plan for the organization. This gets donors, stakeholders, volunteers, and investors excited for the future, but more importantly they want to know that the plan can become reality. 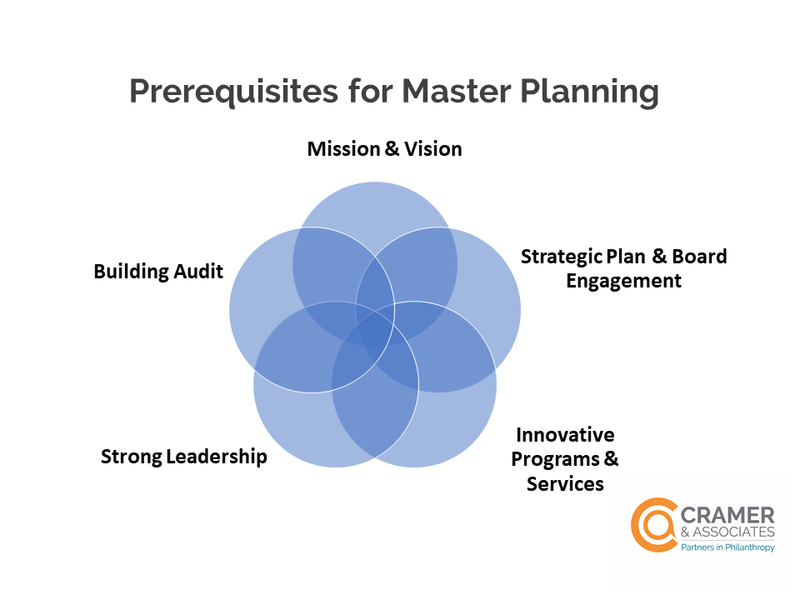 Cramer & Associates has worked alongside many philanthropic partners, including Franklin Park Conservatory and Lakeside Chautauqua, to create Master Plans and believes there are five vital prerequisites to developing a master plan. 1. Mission and Vision – It is important that your Board and executive staff be part of setting and affirming your mission and vision statements. This invites stronger engagement by the Board and your mission and vision statement will be central to your planning process. If your nonprofit hasn’t developed its mission, set up a strategy session with your Board and executive staff as your first action item. 2. Strategic Plan – A strategic plan develops your priorities and framework for where your organization wants to go in the future. The strategic plan informs the master plan about where you are headed. By involving your Board in this process, you are engaging them to be part of building your roadmap for the future. 3. Program & Service Needs – Programs and services are how your mission comes alive. Your organization must understand all of its current program and service needs fully, new program and service opportunities, and programs and services that may be eliminated in the future. We have discovered that this is a key area that is often times missed when beginning the master planning process. Conducting a program assessment will give your organization this important piece of information to provide during your master plan process. 4. Strong Board and Staff Leadership – Strong Board and staff leadership is important as they will be working with your third party planners and consultants. Your nonprofit may select to use a steering committee which is a hybrid between staff, Board and community members, who bring a wealth of expertise to the forefront and engages key stakeholders in the planning process. 5. Building Audit– Knowing how you use your current facilities, buildings and land; as well as the condition of your structures, paves the way for a propelling master plan. A professional master planning firm can conduct a building, land and infrastructure assessment for you. This will give your organization an analysis of the condition of your buildings, discover opportunities for changing the use and potential new opportunities for your facilities and land. Having these key prerequisites finished before you sign a contract with a master planning firm will set your organization up for a success.